Test effectiveness is a central quality aspect of a test specification which reflects its ability to demonstrate system quality levels and to discover system faults. A well-known approach for its estimatation is to determine coverage metrics for the system code or system model. However, often these are not available as such but the system interface only, which basically define structural aspects of the stimuli and responses to the system. 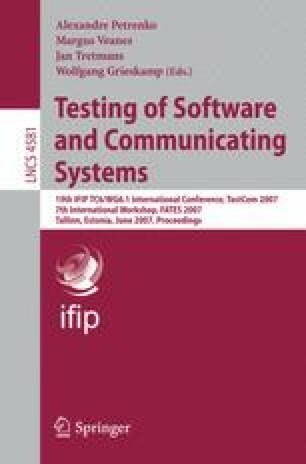 Therefore, this paper focuses on the idea of using test data variance analysis as another analytical approach to determine test quality. It presents a method for the quantitative evaluation of structural and semantical variance of test data. Test variance is defined as the test data distribution over the system interface data domain. It is expected that the more the test data varies, the better the system is tested by a given test suite. The paper instantiates this method for black-box test specifications written in TTCN-3 and the structural analysis of send templates. Distance metrics and similarity relations are used to determine the data variance. This work has been supported by the Krupp von Bohlen und Halbach - Stiftung.